Have You Ever Seen a More Touching Story About a Blind Dog’s Rescue! 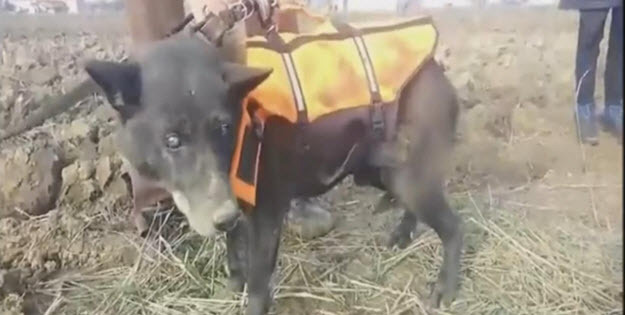 An older blind dog named Christmas was who had fallen into a well and had remained there for at least a month was rescued and found to be in relatively good physical condition according to the Harmony Fund, an international animal rescue group out of Holden, Massachusetts. How Christmas fell into the well was uncertain. The dog could have intentionally been thrown into the well or fallen into it by accident. The good news is that local children who had heard the dog barking threw food scraps into the well to help keep him alive. After a team of rescuers heard of the dog’s plight, they drove to the site and rescued him. Wishing You Could Dine Out With Your Dog? You Can in Las Vegas! Has Your Dog Ever Done THIS With You? What It Reveals Is Amazing! DO YOU WANT TO GET MORE DOG LOVER NEWS, FUN PICS and HELPFUL TIPS? I Want to be a Dog Lover Master! I want my dog to hate me! GET THE DOGGITY POST EACH WEEK! I want to get the Best Dog Lover News, including Heartwarming Stories, Fun Pics and Dog Health & Training Tips in my Inbox once a week! Just sign up below and we’ll start you on your way to a Fun Day and being a Master Dog Lover!